Weddings, Corporate Events, Fundraisers, & More! Our entire professional 360 team is committed to meeting those needs. As a result, a high percentage of our business is from repeat customers and referrals. We'd love the opportunity to earn your trust and deliver you the best Photo Booth Rental and DJ Services in the industry. Rent a Photo Booth today or book an amazing Wedding/Party DJ that will get your guests on the dance floor. We now offer Karaoke DJs with multiple wireless microphones. Contact us below to determine the package that is best suited for your event! We only ask for $99 to reserve your photo booth and it goes towards the total price of your package. We are not a franchise and are owner-operated. Don't take a risk by getting a bad product to save a few dollars...We use the best & fastest printers in the industry. Make sure you have the best quality service and pictures! 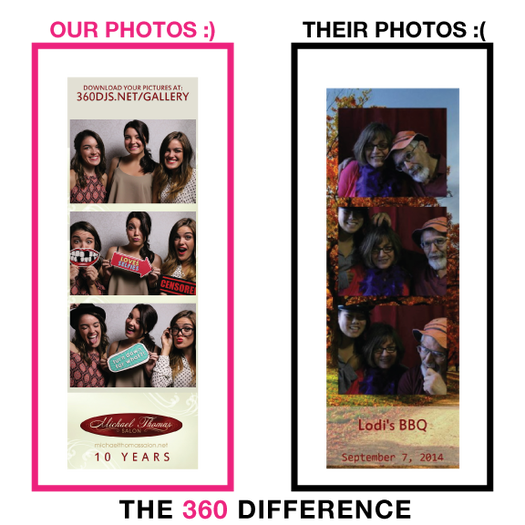 ​Compare our work to any photo booth in the country! We are constantly improving our service and adding new features to make sure WE stand out and YOU get what you pay for. See What Others Have To Say About 360! We use Canon DSLR Cameras in all of our print packages, NOT cheap Webcams or cameras that are built in to a computer or tablet. Ready to Capture Some Memories? Call us today to discuss having a DJ, Uplighting and/or Photo Booth for your event. We are located in Beverly, MA and travel all over New England for events. Check out our reviews on Google, Thumbtack and Yelp! Looking for pictures from your event? Check out our Gallery! "The bitterness of poor quality remains long after the sweetness of low price is forgotten."